According to the VertiCrop site, using the system requires just 8 per cent of normal water consumption used to irrigate crops, can work in any climate, can grow more than 50 varieties of leafy green vegetables, and offers yields about 20 times higher than normal production of field crops. Valcent’s vertical farming system was named in 2009 by Time magazine as one of the top 50 innovations of the year. Urban farming has been around for quite some time now in New York City, all the way back to New Amsterdam times… The idea of having food grown in an urban community might seem strange today, without knowing exactly how it works or why it serves such an important purpose. For starters food production in America is constantly increasing to support the fast growing population. 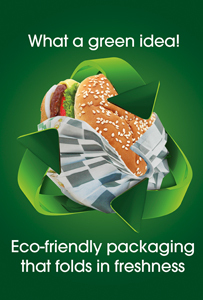 Our main source of food relies on fertilizer, machinery, transportation, packaging and conditioning- all based on fossil fuels. With an increasing population and over 50% of us living in cities, we need to establish another source of food production. We believe that urban agriculture serves a vital role in improving urban communities by increasing access to fresh vegetables, improving community interaction and decreasing the footprint of the food system. CNN says: “An old meatpacking plant on Chicago’s South Side is being transformed into an eco farm, which its founders says will produce food sustainably, while creating zero waste. American entrepreneur John Edel is the founder of “The Plant,” a vertical-farm initiative that he hopes will show people the ease of adapting to green food production in urban living environments. 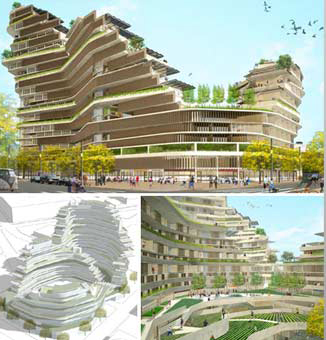 A vertical farm is an urban agriculture concept whereby food is grown in and on top of buildings in city areas. 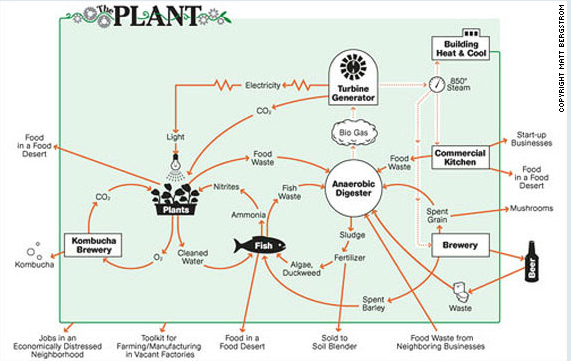 In order for this process to work, urban farmers use a variety of techniques, including hydroponics — cultivating plants in water — and aquaponics, which uses by-products from fish farming to assist hydroponic growth. The Plant’s anaerobic digester uses bacteria to break down organic waste into biogas — comprised of methane and carbon dioxide — and material that can be used as fertilizer. A “combined heat and power system” will convert the methane into energy, which Edel says will take The Plant completely off grid and allow it to produce large quantities of food with zero waste output. Despite still being under construction The Plant currently has five tenants, including aquaponic farms, a hydroponic farm, bakers, tilapia fish breeders, a mushroom garden and a kombucha tea brewer (a type of tea said to have health benefits). Their products are sold to local restaurants, cafes and markets, as well as used to produce more food within the farm itself. Edel hopes to have the farm fully operational by 2014 and says that the facility will create 125 new local jobs. No word on how exactly the Plantagon system works, but the company says that consulting engineering firm Sweco has helped untangle the technical kinks of the project. Plantagon hopes to have its first vertical farm up and running within three years. 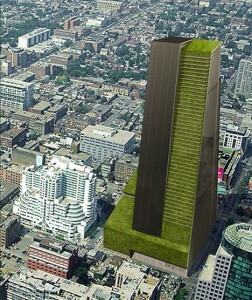 Gordon Graff of the University of Waterloo, Ontario, designed the Skyfarm to appeal to green-minded Canadians who want to see cities taking action. His 59-story building is covered in vegetation: a hydroponic farm that would produce about 50 percent of its own needed power with an on-site biogas plant burning farm waste. The other half of the needed energy could come from city waste, according to Graff. 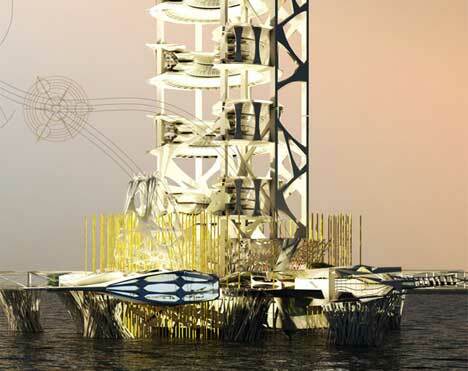 Could a sea-based vertical farm have an advantage over a land-based one? It’s very possible. This particular design is from Australian architect Ruwan Fernando. Fernando’s design consists of five stacked U-shaped enclosures, which can be used for a variety of functions: public space, residences, research, food production, energy production and more. The shape of the levels – and the space between each – helps to let in the maximum amount of natural sunlight, reducing the electricity needed to power the structure. 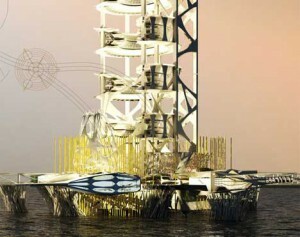 Fernando sees several of his sea-based skyscrapers being grouped together to form a networked food production colony. Concept design (Standard): Co-Op Canyon inspired by Anasazi cliff-side villages. The community is intended to house 1,000 residents and be completely self-sustainable, producing enough food, power and water for the entire village. When people think of urban areas, they usually think of lots of concrete, tall buildings and not much green space. 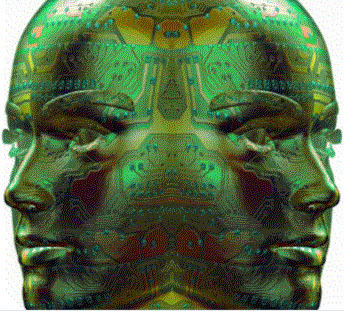 In fact we will have such diversity of green buildings and new exiting technologies, that life will be kind of amazing, for sure interesting and far from the old ways.. By allocating space for urban agriculture, individuals get reconnected with their food source and nature while still enjoying the city life. It can help to serve as an escape from the everyday craziness that has become our lives. GreenDustries loves these new methods of combining urban life and nature! Saving energy is the only solution for a healthy future for our children, all mankind and ourselves. It seems to us like a new and exciting way of life is up ahead. Combining glass, concrete and of greenery will bring balance to our cities. We look forward for that time to come quickly.